Note: This code of the eye_aspect_ratio function is directly taken from here. All credits for it should go to Adrian at PyImageSearch. In order to calculate the Eye Aspect Ratio, we need to detect the outline points of the eyes first. 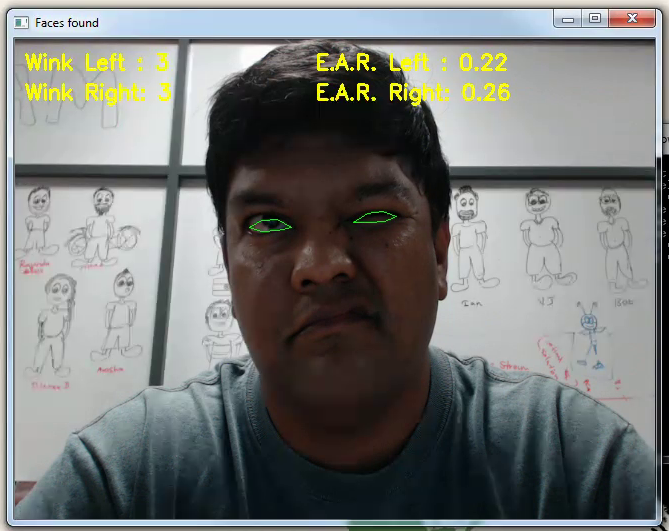 And, in order to detect the eye points, we first need to detect the face, and then detect the face landmarks. So, we'll be using the same steps we used when extracting individual facial features from Dlib Face Landmarks. The EYE_AR_THRESH defines the threshold for the EAR value where we consider the eye to be closed. You may need to experiment a bit with this value, as it may depend on your camera and the background lighting. The EYE_AR_CONSEC_FRAMES defines the number of consecutive frames the eye needs to be 'closed' in order for us to detect it as a 'wink'. Again, experiment with this value a bit to get a good value for your application. The COUNTER_* and TOTAL_* variables holds the consecutive 'eye closed' frames and the total number of 'winks' respectively. With the variables ready, we start detecting the face, and its landmarks, to isolate the eyes. Before we calculate the EAR values of the eyes, we want to draw the outline of the eyes. We use the convexHull and drawContours functions of OpenCV for this. Now, we calculate the EAR for each eye, and draw the value on the video frame. With the EAR values of each eye calculated, we check whether the value for each eye has gone below the threshold we set earlier, for the minimum duration of frames we set, and increase the counters if it has done so. PREDICTOR_PATH = "path to your shape_predictor_68_face_landmarks.dat file"
Thanks Shirish Ranade for the idea of wink detection, and Adrian at PyImageSearch for the excellent tutorial that helped get me started.